We named our website "Relax on Lake Michigan" because that is what this house is all about! 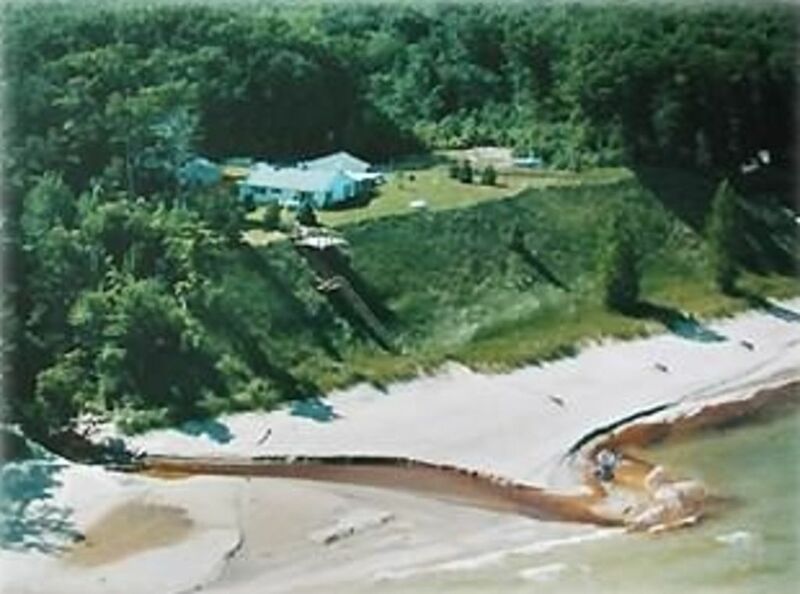 Our waterfront, ranch home has 3 bedrooms, 2 baths and is more than a cabin or cottage...it is a real Lake Michigan paradise! Miles of Sandy Beach with an amazing view of the lake. Enjoy our 3 season sunroom, great Hickory Kitchen, living room with 55" Roku tv, a Master bedroom with attached bath plus 2 other bedrooms, one with a queen and the 3rd with a queen and twin bunks. Even a HOT TUB* on the deck with a view of the lake. *Closed during the winter. Inquire about dates. Have a bonfire at our private fire pit steps from the house. What a perfect way to end your day, watching the sun set or as the stars appear in the night sky. Want more excitement? Then gear up for river trips, charter fishing, world-class golf, CASINO excitement or even an airplane ride. With all there is to do - or not do - this will be the spot you will want to return again and again. My husband Michael has just retired after owning his own landscape business in the Chicago suburbs and I am the perennial 'mult-tasker' having worked as an actor in Chicago, helping with the landscape business, being a lifestyle and job coach and running our vacation home business. Our family of 5 had been vacationing in northern Michigan since 1985 and longed to have a place of our own. In the summer of 2003, we found a lovely road off the highway that have wonderful beaches and wasn't 'touristy'. We looked at a couple of properties but they didn't fit our budget. Then that fall, I found a listing online and we decided to drive up (300 miles) and couldn't believe how perfect it was for us. The only way we could afford buying it was to rent it out and as they say, the rest is history! 2 bathrooms: 1) One off of the master bedroom with a tile walk-in shower. 2) Second bathroom had a soaking tub with a shower and is located off of the hallway with 2 bedrooms and living room. Amazing 360' of view with a fire pit steps from the sunroom. There is also a large deck off of the sliders from the living room. Private, shared beach north of the creek. Access is down our 65 steps. Free long distance within the U.S.
2 car garage with storage one one side and a parking spot for you on one side. 3 additional parking spaces on the driveway. Comfortable couch facing the 55" Roku TV and view of the lake. The sliders lead to the deck, hot tub and stairs to the beach. 2 chairs by the big picture window are facing the water. Bagel sized toaster plus a toaster oven. Fully stocked with all appliances large and small. 2 dining areas: 1) Kitchen table sits 4 plus there are 3 stools at the kitchen counter. 2) Table for 4 is in the adjacent sunroom. Large lawn area perfect for games. Large deck off of the living room where the hot tub is located. A few steps from the larger deck takes you to the lakeside deck and the staircase which is how you get to the beach. Many golf courses within 10-30 minutes. Check out Arcadia Bluffs which is one of the countries premier courses only 30 minutes away. Good for our guests who use a wheelchair because everything is on one level...even the deck to enjoy the view! Private location off the living room with a view of the lake. IMPORTANT: I require speaking to all potential guests before booking to make sure our home fits your needs. Sometimes this site has incorrect/incomplete pricing so this is how I confirm costs with you. Great place to stay at!! My family and I had a wonderful time here for an October vacation. We felt very comfortable in the home. It had everything we needed. The view is amazing. The location is perfect for hitting many of the small towns along the coast. Thank you for sharing your home with us! Glad you and your family enjoyed Heaven! I see why the owners call it "Heaven". Absolutely amazing. The pictures from this listing do not do it justice. The home was very clean and beautiful. Everything you could need was already there. Felt like home. The property was equally amazing. Breathtaking view from almost any spot inside and out. Breakfast in the Sun-room with an amazing view. Lunch on the bluff with an incredible view. Dinner and drinks on the patio while the sun sets, and a soak in the hot tub under the stars. Did I mention the view..? Couldn't get enough. Everything was perfect. Sad we had to leave. Thanks, John, for the glowing review! It warms my heart to hear that others enjoy this home as much as I do! Thanks for being such a great guest. We look forward to having you return. The location is perfect, you can enjoy lake view whenever you want. The sunroom is extremely great because you can enjoy the view while stay comfortably inside. The rooms are spacious, it's enough for 6-8 people. Our host Eileen was very easy to reach and willing to provide assistance. I would definitely recommend this place to my friends and would like to come back again. I'm so happy "Heaven" exceeded your expectations! We look forward to having you return. A quiet lakeside property with all the amenities. The sunroom, even on a cloudy day, is a great spot to lounge or eat breakfast or lunch. Our hosts were on the spot to answer any little problem we might have, and that is a huge plus. You may not ever want to leave our quiet private home on Lake Michigan but if you do you'll find golf courses, a casino, mini-golf, restaurants, shopping all within 15 minutes away. SPRING, EARLY SUMMER AND FALL RENTALS: - 3 nights or longer - Linens and towels are optional and not included in the above pricing. Pillows and blankets always provided. HIGH SUMMER RENTALS - One week rentals from Saturday to Saturday from mid June through August. - Linens and towels are optional and not included in the above pricing. Pillows and blankets always provided. NOTE: We ALWAYS speak to guests before booking. We DO NOT accept wire transfers. Beware of scammers who do.